6 BRIGHT & VIBRANT COLORS -- Silver, Yellow, Rose Red, Purple, Green, Blue. Use one or several, use them individually or mix and blend colors. 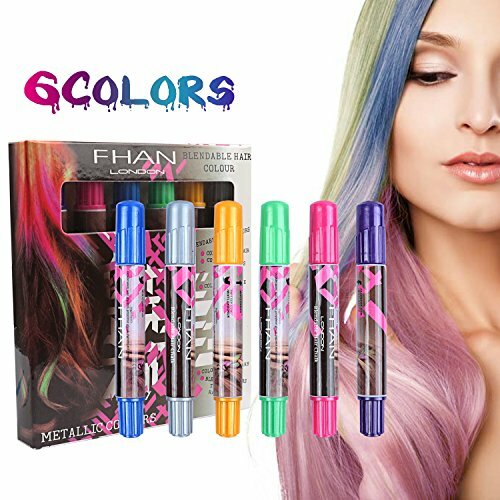 SAFE & EASY TO USE -- The hair chalk is non-toxic, non-allergenic, Change your hair color in minutes, you can try DIY dyed colorful colors at home, braided multi colored hair braids look better. LONG LASTING & EASY TO WASH -- Easy to apply and dries in 30 seconds, and it always lasts up to 3 days on hair. It\'s easy to be washed out with ordinary shampoo and water. MULTIPLE USAGES -- Suitable for parties, clubbing, festivals, cosplay or other occasions, creating you a beautiful and unique look for yourself. NOTE -- Very easily apply to the light hair, especially gray and blond hair. It is a bit difficult for the dark or brown hair to apply, you can apply to white color firstly, and then apply to other colors you like and you can apply it for a few more times and it will be better.